I learned of this exhibit from LISNews.org. If you live in Virginia or close to it, perhaps you can go. “Beyond Text and Image: The Book as Art” opens on Thursday, Feb. 25, in Staniar Gallery, Wilson Hall, at Washington and Lee in Lexington, VA. Curated by W&L humanities librarian Yolanda Merrill, the exhibition showcases 30 works by nationally known book artists. Merrill will give a curator’s talk and slideshow on Wednesday, March 3, at 6 p.m. in the Concert Hall facing the Gallery. The lecture will be followed by a reception in Lykes Atrium, adjacent to the Gallery. The exhibit, curator’s talk and reception are free and open to the public. Merrill herself has many years of experience as a bookbinder and bookmaker, and has co-taught a course in the book arts at Washington and Lee. A selection of the student work made in the course is on display in the Lykes Atrium. The focus of the exhibit is on sculptural books. However, there will also be photographs and other two-dimensional works in the show. Washington & Lee. 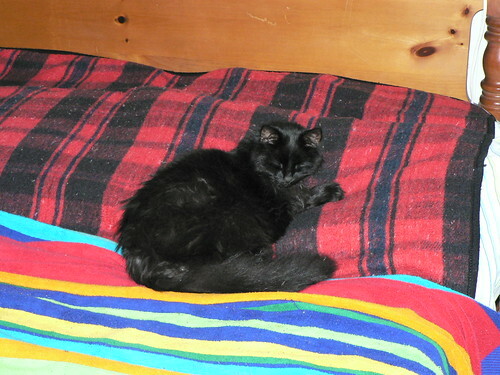 Blackie, there will never be another like you. We will miss you always. Japanese bindings are sewn bindings that I find very beautiful. 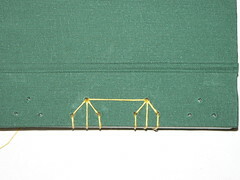 There are different sewing patterns, including a four-hole, tortoise shell, hemp-leaf, and noble binding, these are all considered stab bindings. The first time I did any of these bindings was from a kit I bought. I wish I remembered where, because it was a great kit that included patterns for each of these binding styles. It also included all of the papers, as these are traditionally made with paper covers, and small bits of silk that are placed over the papers at the corners and are held on by the sewing to provide extra protection for the corners. I don’t have any photos of those kit books though I still have them. It had been so long though since I had done them, that I wished to relearn the tortoise-shell binding and to experiment by using boards for the cover. So, I began by determining my size, which when covered is about 5″ x 7 1/8″. The pages themselves are 4 7/8″ x 5 7/8″. So, like any book, I began by folding the pages. 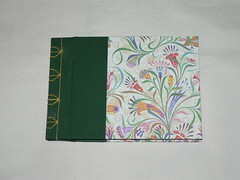 Traditional Japanese binding has the pages folded in half with the loose ends going to the spine. 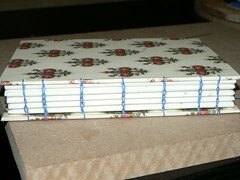 Once the pages were folded I cut my boards and cloth and made my covers. 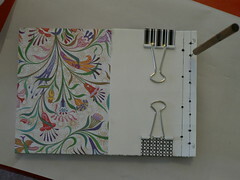 Once that was done, I was ready to create the template for the binding. Never having created this kind of template before, I began by marking two lines, the first was 1/2″ from the spine, and the other was 1/4″. Then I started to mark the sewing stations. Basically, each of the Japanese bindings are based on having four holes. The difference is that the tortoise-shell, hemp, and noble add additional holes to create different patterns. So, to create this template I divided the four main stations equally across the book, while trying to leave 1/2″ from the last station on the 1/4″ line from the head and the tail. Let me tell you, I did a lot of erasing before I got the pattern right to my eyes. 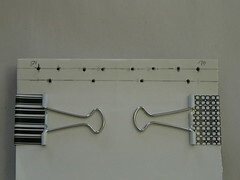 As you can tell from the picture, I use the binder clips that you can get from Staples to hold the text block together. I did this both for the stabbing and the sewing. I find the binder clips strong and really helpful. The thing to keep in mind with using them is that you may want to put extra paper underneath the clips to keep them from marking the paper. I used a bodkin to stab the holes. Usually when you create the holes for sewing, you want them slightly smaller to allow the needle and thread to widen them just enough to keep the binding tight. I found with this book in particular, because I was going through the holes multiple times, I really needed to make them larger in the boards than I could with the bodkin. I ended up breaking multiple needles on this binding because the holes in the boards were too tight. After that happened a couple of times, I used an awl to enlarge the holes on the boards. The sewing actually begins in the middle of the text block. You open the book in the middle of the second station and go out through the cover on the 1/2″ line, leaving about a 4″ tail that you lie toward the foredge. 1. You then wrap around the outside going through the opposite hole you began at and out through the cover again. 2. You then take the thread through the sewing station on the left (1/4″ line) down through the book and wrap around the spine to go in through that hole on the cover again. 3. From the back, you then enter the top hole (on the 1/2″ line) and go back to the top. 4. You now go through the hole on the right (1/4″ line) down through the book and wrap around the spine going back through that hole again. 5. From the back, you then enter the top hole (on the 1/2″ line) and go back to the top. You then take the thread to the next station and repeat the pattern again. The only difference is in the next station, most of the pattern will be repeating from the bottom to the top instead of from top to bottom. 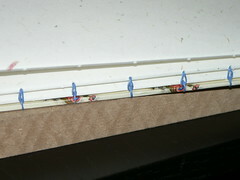 Once the pattern is complete at the fourth station, the thread is wrapped from the top around the tail and returns through the top hole on the fourth station. Then its a matter of sewing the straight lines between the stations by going up and down through the tops of each station to station one where the pattern still needs to be sewn. Once the pattern is sewn there, the thread is wrapped around the head, goes out through the top station and down into station two where it all began. At this point, you want to take the needle back into the middle of the text block where you began so that you can tie off the threads and finish the binding. Now, I had left a lot of space between my binding and my hinge, so I found this virtually impossible to do, so my book isn’t quite as finished looking as I would like. So, don’t leave a large gap between the binding and the hinge if you are going to use boards for the covers. So, once all of the sections have been joined except the last one, it’s time to find the top/bottom cover. This cover is sewn on at the same time as the last section, just as the other cover was. I highly recommend Smith’s book for the description of how to finish this binding. His books are available at http://www.keithsmithbooks.com/. I’m sorry that I can’t remember exactly how I followed his instructions for this. returned to create a loop around the next to last section and enter the final section. Boy that sounds complicated. I think I missed looping properly from the cover to the next-to-last section which may be what contributes to the loosey goosey feeling of my binding. then returning into the sewing station and continuing to the next. Here’s the final product. I think this is a complex binding that I’m glad I tried. I hoped I’ve at least managed to give an overview of the process. After folding the sections and sizing the boards for the covers, I covered the boards and got ready to create a template for marking the stitches. Sewing stations should be less than 1 inch apart, though the stations at the head and tail are supposed to be between 1/2″ and 5/8″ inches away to strengthen the book and keep the head and tail tighter. So, for my book, the head and tail stations are about 1/2″ from the top of the section, and the next closest sewing stations is about 1/2″ from the first. The middle stations were spaced evenly at 1″ apart. So, I had a total of 7 sewing stations. The holes in the cover boards were punched about 1/8″ in from the end. 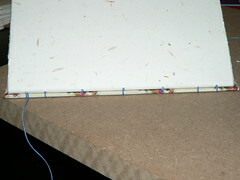 Keith recommends doing this type of binding by sewing on a supporting board. As you can see from the picture, I did try to do this. It worked, but I think it’s necessary to have a workstation that you can sit at where the board and book are above waist height to make this a truly comfortable way to work. I did this on a coffee table and found that it was hard to do. I can’t give a detailed description on how the sewing is done. I no longer remember all the details. I can give a brief overview though. You start as you usually would from the inside of the first section to the outside and then it loops around the board from the outside to the inside. The thread then wraps around itself as it goes back into the first station heading to the tail. Keith’s book has very helpful diagrams that really make this clear. The pattern that he teaches is a chain pattern. 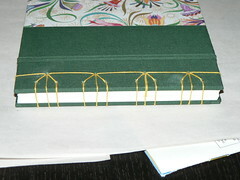 There are many different patterns that can be done with Coptic binding, so don’t think that this is the only one. It’s really important to try and keep the same tension throughout the sewing so that the chain emerges clearly. Too tight, and the chain disappears; too loose, and the chain becomes unweildy. I think I got the tension somewhere in the middle pretty consistently. I thank years of crocheting for helping me with that. Embroidery also helps with teaching a consistent tension in sewing. After attaching the board at the final station, it’s time to add the next section. Rather than going back into the final sewing station on the first section, the thread is woven under itself as it emerges on the inside of the cover and then enters the first sewing station on the 2nd section. It then proceeds on the inside to the next sewing station. Now it’s time to start making the chain pattern. Basically, the thread comes out of the second station and wraps down around the sewing below it and goes back into the hole. I’ve seen so many examples of this style of binding that I thought were beautiful, so I wanted to learn it. I found an example in Keith Smith’s book, Non-adhesive binding: Books without paste or glue, vol 1, and used that to learn from. 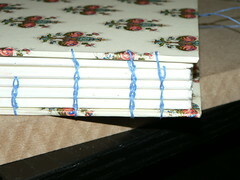 I did complete the binding, but I’m not sure that I would ever do another. Advantages – it opens completely flat. A huge advantage if you want to use the full sheet of paper. And, it’s great for photos. But, I really don’t like the loosey goosey feeling of the binding. It’s most probably my stitching of it being too loose, but I don’t know. Let me see if I can remember the process that I followed and document here as I did other projects. Basically I began by folding the sections and decided to have 5 sections and used those to determine the cover sizes once they were folded. So once, I determined the size and cut the boards, I covered them and got ready to create the pattern for stabbibg the pages and the covers. Well, I’ve gotten the photos of the projects I did last spring up on flickr at long long last. Now to blog about them.